I recently found out that the 1977 film Ghosts That Still Walk is not talked about constantly in your universe. I am determined to correct the situation through the method of a detailed review. Not only is the film not discussed constantly, but also some critics in your universe do not even recognize its merits. For example, HumanoidOfFlesh writes, "'Ghosts That Still Walk' looks cheap and is full of dull sequences." 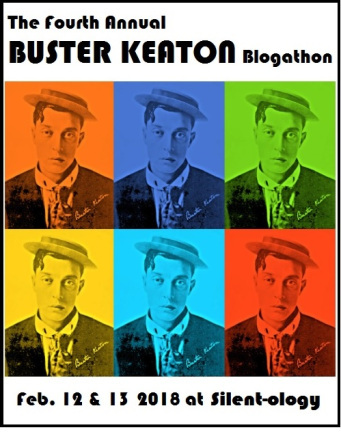 Reviewer roddmatsui writes, "This is actually REALLY BORING, overall, and it will make you fall asleep the first couple of times you try to watch it. But if you keep at it, you may just make it to the end." And reviewer SleepKills believes "the acting in the film isn't all that great and the film sometimes seems to get a little bit boring." A 15-year-old boy named Mark is wheeled in a wheelchair down a hospital corridor to an X-ray machine. When he sees the machine, he says, “Wow, real Marcus Welby stuff.” Of course, this is how we all feel when faced with sophisticated medical technology. Unfortunately, the X-rays of Mark’s skull cause him a great deal of pain—so much pain that for some reason the nurse draws blood what appears to be the heel of his foot. The titles are shown over images of blood filling glass tubes and vessels, then becoming green and flowing through a spiral tube. The doctor refers Mark to a doctor named Ann Sills, an M.D. with a Ph.D. in Psychiatry (highlighting an interesting difference with my universe, where psychiatry is a medical specialization covered by an M.D.). The film dissolves to Dr. Sills’s office consultation with Mark and his grandmother, which takes place in what appears to be a Victorian bordello. She also has a locked copy of the Necronomicon on her desk. Mark explores the office, which, like most psychiatrist offices, also features a collection of demonic masks, skulls, and crystal balls. During the interview, it comes out that Mark’s mother, who is suffering a nervous breakdown, is writing a children’s book about ancient Indian cliff dwellers. Also, Mark hears a psychic female voice in his head saying, “I want to know everything about you.” It also asks, “How did you learn to make these beautiful baskets?” The question impels Mark to smash open a glass case and pull out an Indian basket, after which he tells his grandmother that he tried to kill her. 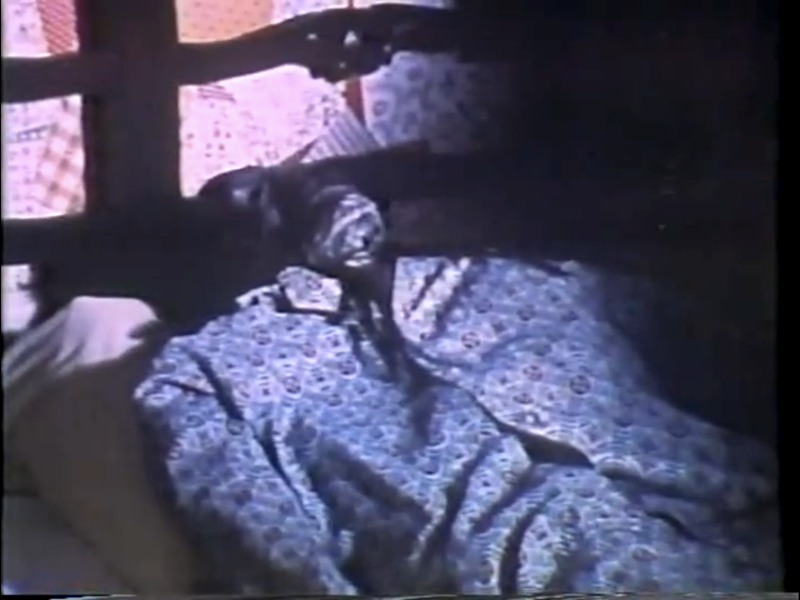 Later, Dr. Sills hypnotizes Mark’s grandmother as she sits in a leather armchair wearing a heavyVictorian nightgown. 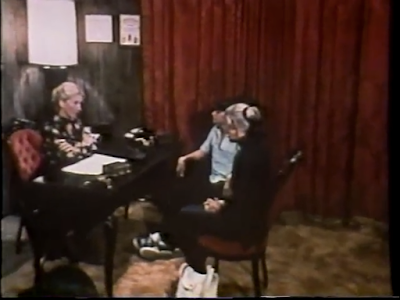 The hypnosis session is taking place in a sound studio, with Dr. Sills sitting in the control booth, manipulating the sounds and lights in the interrogation—that is, hypnosis—room. 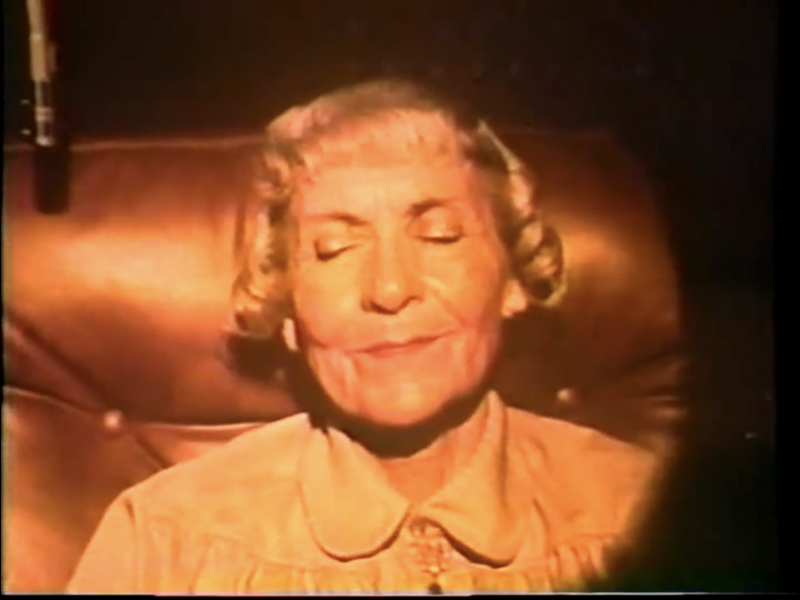 Despite the orange spotlight shining in her face, and the phallic microphone hanging next to her cheek, Mark’s grandmother falls into a hypnotic state. Hypnosis leads into an irrelevant flashback to the summer of the same year, as Mark’s grandmother Alice and her husband Harold (whom she calls “Dad”) are shopping for motor homes. 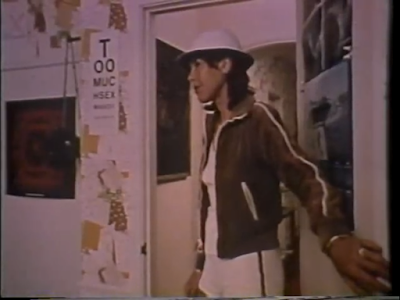 Later, Alice and her husband take their new motor home to Calico, the ghost town tourist attraction in the Mojave Desert, where they explore a slanted room. “It’s such an adventure,” Alice says. Then she makes a sales pitch to no one in particular about the benefits of having a kitchen in a motor home. Unfortunately, the paradise of motor home pot roasts is interrupted by the ghostly movement of the motor home’s ignition keys—a movement that somehow forces the vehicle to swerve slightly. “This damn thing has a mind of its own,” says Harold before the motor home eventually drives by itself off the road and into the desert. It drives for about five minutes, tires squealing on sand, until it finally stops. As they are enjoying dinner, they see something moving toward them across the desert. Harold takes his binoculars outside to see that a boulders is rolling toward them. “Harold! What is that thing?” Alice screams. He refuses to tell her it is a rock, for unknown reasons. 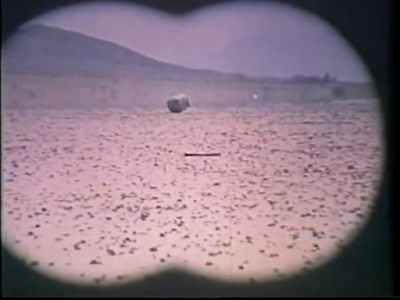 Suspensefully, more boulders begin rolling across the desert as Harold tries to fix the starter wire. 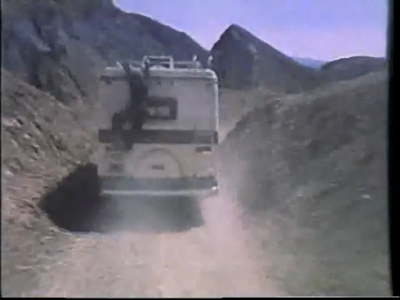 The rocks bounce up onto the RV’s roof, even as Harold gets the vehicle in motion. “It’s the devil,” says Alice. “Only the devil would move the rocks in hell.” She starts reciting the Lord’s Prayer. 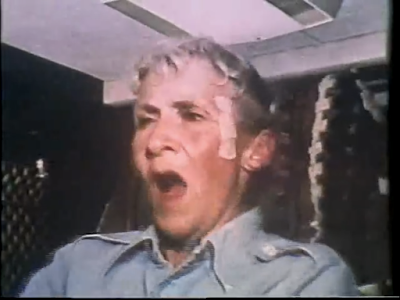 The filmmakers show about five more minutes of the motor home squealing through the desert, this time chased by rolling rocks, which start to strike the vehicle, crashing through the window and hitting Alice in the forehead. 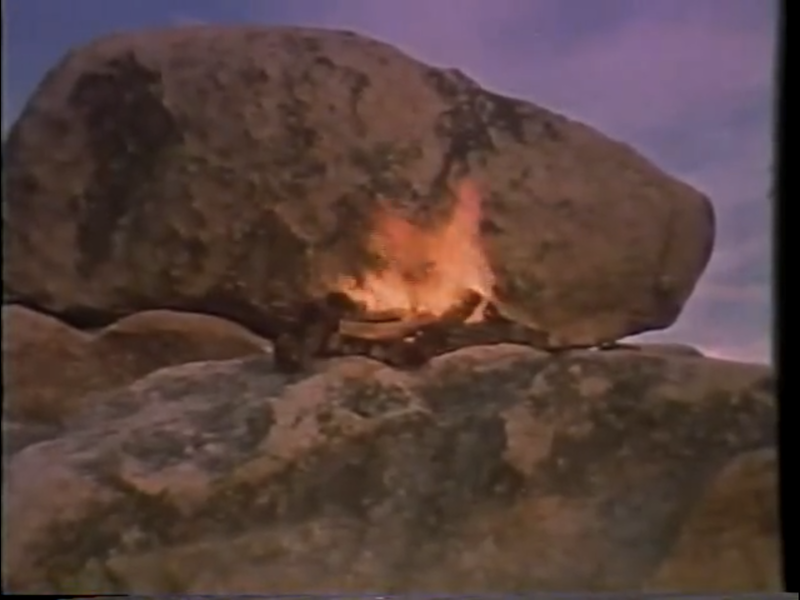 Finally, the largest boulder leaps up onto the RV’s roof, but it just falls off harmlessly, probably due to Helen’s rendition of the Lord’s Prayer. 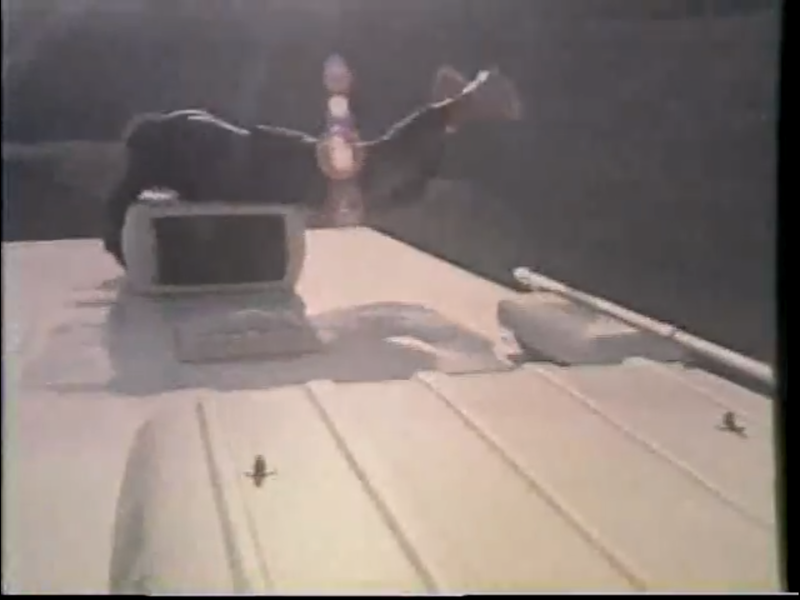 Back in the flashback, now that the elderly couple is out of danger, Harold climbs onto the roof of the RV to fix the air conditioner. The haunted keys start acting up again, starting the engine and moving the RV while Harold is still on the roof. Alice tries to steer, with a Band-Aid on her head, while poor Harold hangs on on the roof. The thrilling sequence goes on for at least five minutes until the vehicle rolls to a stop at the base of a cliff. 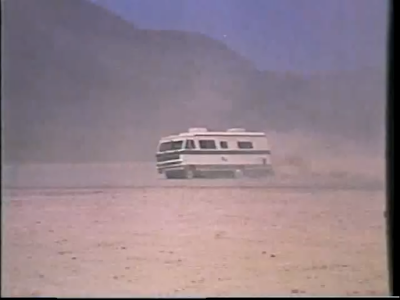 The entire event precipitated Harold’s heart attack, though he ended up driving the RV back home. The film then movies into Mark’s mother’s story. She enters her suburban house, thinking about how she will experiment with astral travel to contact the spirit of the dead mummy Indian. “Your astral body is still alive,” she says to the mummy, which sits on a counter in the living room. “Only your physical body is dead.” She says everyone has three bodies: a physical one, a spiritual one, and a body on the astral plane. “You’re welcome here,” she tells the mummy. “I took you from your resting place in the desert.” She remembers finding a cave in the desert (contradicting the notebook Dr. Sills read which says she borrowed the mummy from a museum). 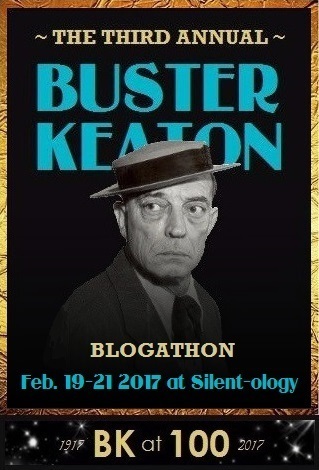 When she gets near the cave, her cane-mounted geiger counter goes crazy, forcing her to drop it into the dirt at least six times. She continues trying to coax the Indian mummy into the physical world, mainly by tossing and turning in bed while moaning erotically, for some reason. The mummy story is then interrupted by Mark’s visit to Dr. Sills’s office, where the doctor hypnotizes him in the sound studio. When he tells her his mother’s book is about Indians, he has another seizure, but the doctor solves the problem by telling him he has no pain in his body. “You’re unable to feel any physical pain, Mark,” she says. “Kalukilana balana,” the possessed Mark says, which causes the champagne bottle to explode telekinetically and an 8-track to fly into its player (though no music plays). Then we watch as an astral projection climbs out of Mark’s prone body, and his mother enters the room, screaming—because Mark’s pajamas are now filled with the desiccated mummy. The trip to the desert was a ruse, however, on Dr. Sills’s part. She reads a book about ancient Indians, revealing that most Indians of the relevant tribe were cremated so that their spirits could reach heaven, but some were buried and mummified as punishment. Dr. Sills tries to explain the situation to Alice. “Because of your religious upbringing,” Dr. Sills says, Alice won’t understand the situation, but Alice says there are many descriptions of astral travel in the Bible. Dr. Sills believes Mark’s astral body left him and was replaced by the spirit of the Indian mummy. They wheel Mark to the cave that his mother found earlier. Dr. Sills tells Mark, “Think back to what happened here 500 years ago.” Before he can do this, however, Dr. Sills explains that the mummy has been controlling mark for one year, causing his mother to go insane and also causing rocks to attack Alice and Harold’s RV. Alice prays for help, and a mummy who is lying among the rocks, rather than in Mark’s mother’s living room, bursts into flames, accompanied by the sound of thunder. In the grippingly happy ending, Mark returns to the body, able to stand and walk again. He hugs his grandmother and the credits roll. One of the most obvious signs of the excellence of Ghosts That Still Walk is the fact that it was far ahead of its time, presaging Pulp Fiction (1994) with its series of stories from different characters' points of view that are occasionally interconnected and all come together in the end. In fact, one might venture to say that Pulp Fiction is an unofficial remake of Ghosts That Still Walk, with the exception that the mysterious treasure of Pulp Fiction is revealed to be a burning mummy in Ghosts That Still Walk (probably Quentin Tarantino's original ending anyway). Ghosts That Still Walk also pays homage to The Texas Chain Saw Massacre (1974) with its shots of mummies punctuated by flash bulbs and strange sounds. In the end, however, Ghosts That Still Walk is a classic because of its limitless imagination, and director James T. Flocker should be proud. 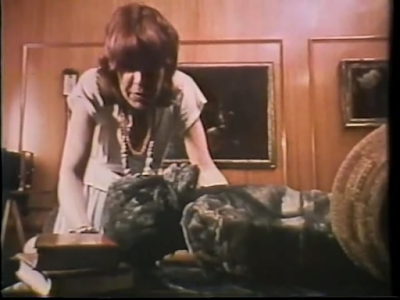 What other film highlights boulders that roll by themselves, hypnosis studios with phallic microphones and light shows, mummies lying on living room tables, and 15-year-old boys with bottles of champagne in their room? I can think of only two or three other films with these elements, and none of them are nearly as entertaining as James T. Flocker's Ghosts That Still Walk.